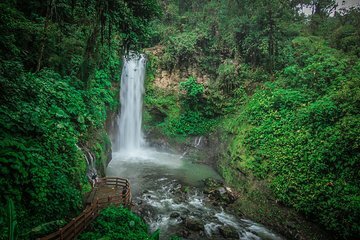 After morning pickup at Your San Jose hotel, leave the city behind and watch the landscape change as you drive past coffee plantations and fields rich with ferns, flowers, and strawberries. When you arrive at La Paz Waterfall Gardens, get an orientation to all that this popular nature reserve has to offer. Designed with eco-friendly principles in mind, La Paz aims to protect Costa Rica’s natural treasures will educating visitors about its extraordinary biodiversity and need for careful conservation. Stroll along more than 2 miles (3.5 km) of walking trails that run through 10 different exhibits showcasing native Costa Rican species. Admire winged wonders at the Aviary, Hummingbird Garden, and Butterfly Observatory, and view the rain forest’s cold-blooded critters at the Serpentarium and Frog Exhibit. Monkey around with rehabilitated spider and white-faced monkeys, and watch rescued jaguars, pumas and other endangered Central American felines prowl (on the other side of safety glass) at the Jungle Cats exhibit. Your can also get a taste of traditional Costa Rican country life at the Casita de la Paz reproduced historical farmhouse and soak up the serene beauty of Trout Lake and natural waterfalls. Midday, take a break for an included lunch surrounded by the lush tropical scenery. The tour concludes with drop-off back at your San Jose hotel in the afternoon. Firstly the tour itself was well run and the guides good, the bus was at my hotel 5 minutes before the agreed time so I didn’t have to wait. The gardens themselves were a big disappointment, the description states that these are rescue animals and I assumed therefore that this meant they would be in good enclosures which replicate their natural environment. This did not prove to be the case with jaguars and ocelots kept in enclosures about half the size of a tennis court and birds of prey and macaws in enclosures where they had no chance of flying. I regret taking this tour. Don't leave San Jose without taking a tour to La Paz waterfalls and animal sanctuary. It's a day of wonder and awe.......hummingbirds whiz by your face with butterflies landing on your shoulder. It doesn't get any better. The tour guide and driver kept us safe and provided a wonderful and entertaining day! This tour was fabulous! The bus was there early to pick us up at our hotel. Hugo our tour guide was fantastic. He provided information on the way there and back as very as being very informative about the animals, birds and plant life at La Paz. The lunch that was included was very good. We also got to stop for strawberries on the way back to San Jose. Wonderful Tour! The guide was very informative and I learned a lot about volcanos. I couldn't see anything due to the fog! Mother nature at its best! But I enjoy the scenic drive to and from the volcano. The church in Cartago is beautiful! This tour does not include lunch so have some snacks in your bag. I really enjoyed this eco-tour. The guide was informative and knowledgeable. And the Driver made me feel Safe. La Paz Waterfall Garden is essentially private property. There are some interesting areas- the Serpentarium has over 30 exhibits of poisonous and venomous Snakes found in Costa Rica the Butterfly Garden was simply amazing. The frog exhibit, the humming birds, the Big Cats, the aviary, the monkeys.... There was simply a Lot to See. The Gardens are fantastic! The included Lunch at the Colibries Restaurant was pretty good with a wide variety of food and beverages served. The waterfalls themselves are awe inspiring. Be warned though- this is quite a hike. The steps can be slippery when wet and are steep. If you go down to see the waterfalls, you have to hike back up. I did them all and am glad that I did. The only issue- I did not See La Paz waterfall!!! I thought that was the whole Point of this tour. The viewpoint to La Paz waterfall was a 5-10 Minute drive from the exit! I saw the falls on a different tour.